This game had everything but a goal. Bengaluru huffed and puffed but Bagan had the better chances.It was a more even contest in the second half and although Bose was sent off with 20 minutes to go the Mariners held out for a point. Its a creditable one for them with 10 men but it does little for their title bid. 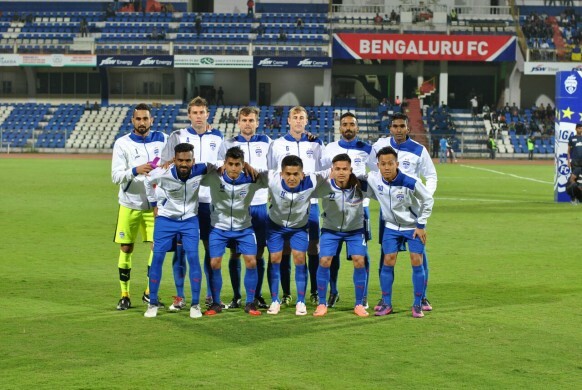 Bengaluru wre solid enough at the back but a bit underwhelming in attack. They are still to beat the Mariners at the Kanteerava and their season trundes along at snail's pace. Good evening from Bengaluru. 90+6' There goes the whistle for fulltime. as the points are shared. 90+3' Kotal fous Vineeth and gets a yellow. Lifted in by Watson it causes all sorts of panic in the Bagan box but a half volley flies over. 90+1' We are into five minutes of added time. Substitution Bagan Sehnaj off Bikramjit on. 88' Watson stops Yusa on the counter and gets a yellow. Bengaluru corner cleared. 86' Jugovic gets a yellow as he exchanges a few words with the referee. 85' Substitution Bagan Balwant off Jeje on. 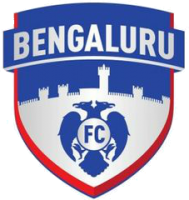 84' Bengaluru change that took place before that chance. Jhingan off Jugovic on. 82' Norde clips in a free-kick and the ball ends up in goal through Yusa but the linesman rules it out for a foul. Yusa gets a yellow. 79' Daniel's shot deflects for a corner taken by Watson and cleared by Yusa. 77' Bagan free-kick taken by Norde who shoots it over the bar. 76' Udanta has his shot blocked and then Juanan fouls Yusa. Free-kick taken short. 75' Daiel finds Chhetri in the box but he shoots at the side-netting. 72' Substitution Bagan Duffy off Prabir on. 69' Udanta releases Vineeth but Bose leaves him sprawling. He's alrady on a yellow. Bose sent off. Bagan down to ten. 67' Chhetri controls and shoots but Kotal blocks.Substitution Bengaluru Lyngdoh off Vineeth on. 66' Yusa finds Norde with a ball down the line but the latter just strays offside. 64' Substitution Bengaluru Nishu off Salam Ranjan on. 63' Past the hour mark and Daniel finds some space but Sehnaj comes in with a heroic on the shot. 59' Nirde's cross and Balwant's first time shot over. 57' Two successive Bengaluru corners cleared. 55' After a lengthy stoppage for Shilton's knock he soldiers on and play resumes. 52' Udanta fouled and as Lyngdoh delivers the free-kick its Johnson who goes up for the header but clatters into Shilton who is down for the count. 49' Chhetri goes down in the box after receiving a long ball from Lenny. Kotal leaves a trailing leg on him but the referee says no penalty. 48' Udanta fouled but Chhetri can't divert Watson's free-kick goalwards. 46' We re back on in the second half. Breezy stuff. Bengaluru have done all the running but Bagan are potent on the couter with their two forwards. Balwant and Duffy have both tested Arindam in the Blues goal. This one is fascinatingly poised. Back in a bit. 45+2' There goes the whistle for the break. Its been an entertaining half of football. 45+1' We go into two minutes of added time. Duffy knicks the ball and tries to find Balwant but concedes possession. 45' Duffy controls the ball, turns and shoots the keeper parries straight to a blue shirt. 43' Yusa's cross just clleared by Johnson and brought forward by Chhetri. 41' Shilton has picked up a knock and gets some treatment. 40' Lyngdoh gets the ball in the final third, turns his man and shoots just wide. 39' Udanta races through on goal but a great tackle comes in from a Bagan shirt. 37' Chhetri gets the ball on the flank and tees up Udanta just outside the box but his shot is catching practice for the keeper. 36' Duffy tries to chip the keeper but thst was ambitious to say the least. 34' Norde bursts down the flanks and crosses to Kotal whose shot is wide. 33' Norde with neither a vross nor a shot catching pratice for the keeper. 31' Kotal lunges in on Udanda. Watson takes the free-kick which is cleared. 28' Nishu goes in with an ugly challenge on Norde and gets a yellow. Yusa delivers the free-kick on a plate for Balwant whose header is parried by the keeper before Duffy's bicycle kick goes wide. 25' Bagan haven't produced much in an attacking sense but they have had the best chance of the game. 22' Lenny is down with a knock and gets some treatment but play resumes. 20' Fereira fouls Daniel and concedes a free-kick. Taken short this time but nothing comes from it. 18' First big chance of the game as Duffy produces a save from Arindam. The corner is then cleared. 15' Kotal lookslike he's marking Chhetri should be an interesting battle that one. 12' The hosts have started the better. Bagan with just the one attack so far. No big saves from either keeper. 10' Udanta tries to turn but Bose brings him down and gets a yellow. 9' Lyngdoh tries a one-two with Chhetri and gets fouled and Bengaluru get a free-kick. Chhetri lifts it over the bar. 7' Nishu with a low cross that Kotal clears. 5' Yusa tries to find Balwant but the keeper races off his line to collect. 3' Yusa overhits an attempted long ball and it goes out of play. 07:00pm The teams are out and kickoff is next. 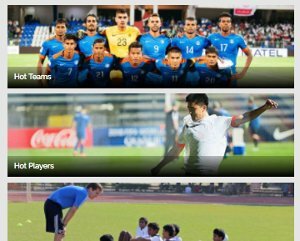 06:55pm Bengaluru's win against Minerva last weekend was their first in six weeks. 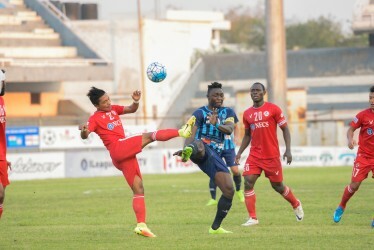 Though they could only follow it up with a draw against Chennai in midweek. The Blues are well and truly out of the running for the title. 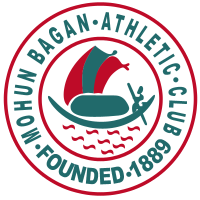 Mohun Bagan XI (4-4-2): Shilton Paul (GK); Pritam Kotal, Eduardo Ferreira, Anas Edathodika, Subhasish Bose; Katsumi Yusa, Souvik Chakraborti, Sehnaj Singh, Sony Norde; Darryl Duffy, Balwant Singh. 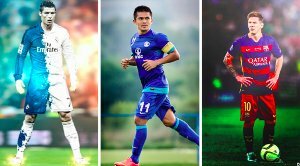 06:45pm Bengaluru FC XI (4-3-3): Arindam Bhattacharja (GK); Sandesh Jhingan, John Johnson, Juanan, Nishu; Cameron Watson, Lenny Rodrigues, Eugeneson Lyngdoh; Udanta Singh, Daniel Lalhlimpuia, Sunil Chhetri. 06:40pm What a game this promises to be. With Aizawl dropping points the door is once again ajar for Bagan with their games in hand but this is not going to be easy for them. 06:30pm Hello and Welcome to the I-League game between Bengaluru FC and Mohun Bagan. This is your host Srinivasan Mohan Live from Kantereeva Stadium.